Facilities: FCI Pekin with an adjacent minimum security satellite prison camp. 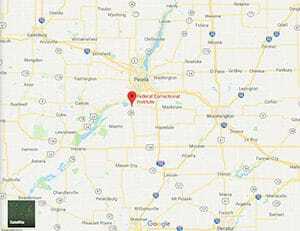 Location: FCI Pekin is located on Route 29 South in Pekin, about 10 miles south of Peoria, 170 miles southwest of Chicago, and 170 miles northeast of St. Louis. Background: FCI Pekin was opened in 1994. FCI Pekin Satellite Prison Camp is located next to, and provides support services for, FCI Pekin. Notable inmates include former Chicago Police officer Joseph Miedzianowski (serving a life sentence for conspiracy and racketeering), Iowa machinist John Tomkins (serving a 37-year sentence for mailing threatening letters and two pipe bombs), and Shon Hopwood (released in 2009 after serving an 11-year sentence for bank robbery). Housing: Inmates are housed in two, three, eight, and ten-person cells within the four housing units. Inmates at the camp are housed in dormitories of two-person cubicles. Health Services: FCI Pekin provides medical and dental sick call, emergency care, medications, eyeglasses, contact lenses, physical examinations, and emergency and routine dental care. Inmates are assigned to a Mid-Level Practitioner, who treats them for the duration of their stay. In order to be evaluated by Health Services staff, inmates must submit a written sick call request. Psychology Services: Psychology Services at FCI Pekin provide professional services in the area of evaluation, counseling, group programs, crisis assistance, drug treatment, and self-help programs. Each new arrival is interviewed and provided a summary of current psychological programs available for enrollment. Common treatment groups include anger management, criminal thinking, and Smart Recovery. Residential Drug Abuse Program (RDAP): FCI Pekin and the satellite camp house a Residential Drug Abuse Treatment Program (RDAP). Both facilities also offer a Drug Education Program, the Non-Residential Drug Abuse Program (NR-DAP) and Alcoholics Anonymous (AA). Education Services: FCI Pekin provides GED and English-as-a-Second Language (ESL) programs. An Adult Continuing Education (ACE) program is taught by other inmates. Various incentives are provided for completing Pre-GED, ACE, and parenting courses. Topics such as Spanish, Real Estate, Public Speaking, and Drawing are offered. A parenting program is also available. High school diplomas and post-secondary programs are available through paid correspondence programs. Advanced Occupational Education: FCI Pekin offers advanced occupational education in Certified Production Technician and Computer Applications. The camp offers training in Computer Applications. Vocational training: No vocational training is provided at FCI Pekin or the satellite camp aside from the advanced occupational education and apprenticeship programs. Apprenticeship: FCI Pekin offers apprenticeships in Institutional Cook, Maintenance Electrician, Quality Control Technician, and Sheet Metal Worker. The camp does not offer any apprenticeship programs. UNICOR: The FCI Pekin UNICOR facility produces industrial products and handles fleet management and vehicular components. The camp does not house a UNICOR facility. Library Services: The Education Department maintains a leisure and law library. The leisure library has numerous books and other reading materials available for circulation and reference. This includes fiction and nonfiction books, newspapers, and magazines. The law library is located in the Education Department. Electric typewriters and a copy machine are available for inmates use. The TRULINCS Electronic Law Library is also available for inmate usage, which allows access to Bureau program statements, federal case law, and much more. Commissary: Inmates are allowed to shop one day per week based on their housing unit or work assignments. The spending limit at FCI Pekin is $360.00 per month. The spending limit in the camp is also $360.00 per month. Inmates are allowed to purchase a wide variety of food and non-food items in the commissary. Recreation Services: Scheduled activities at FCI Pekin include sports, athletics, arts, crafts, music, and entertainment. New programs are introduced as interest and participation warrant. Recreation yards are also available with basketball, handball, and volleyball courts, as well as softball fields and a soccer/flag football field. Billiard tables, bumper pool tables, table tennis, and weight training equipment are also available.